Frequently Asked Questions – Jupiter Jewelry, Inc. The carat is divided into 100 points, so when a diamond is a quarter of a carat, for example, it means that it is 25 points. Gold comes from the earth a bright yellow color, therefore, white gold is naturally yellow too. In order to make the yellow less noticeable white property alloys are added to gold to help mask the yellow color. This is where karats of gold come into play. Most people have heard of 10 karat (kt), 14kt, 18kt, 22kt, and 24kt gold here in the United States. For example, 14 karat gold is made up of 58.5% gold while the other 41.5% is made up of alloys. The most common alloys used in gold are copper, zinc, silver, palladium, and nickel. In white gold, the alloys used are typically the white property alloys silver, palladium, and nickel. These alloys are what make “white gold” white. What does it mean to have your rings polished versus cleaned? Polishing is a multi step process that uses a buffing wheel and multiple rouge compounds to remove tiny lines and scratches in a piece of jewelry. When a piece of jewelry has completed the polishing process it looks brand new. The usual reaction from a customer is that it looks like the day they bought it years ago. Cleaning, also known as a quick clean, is a service that utilizes an industrial strength ultrasonic and a high-pressured steamer. A quick clean takes no longer than five minutes to complete, providing your jewelry is relatively clean. It can take longer if the item has not been cleaned regularly or is extremely dirty. Therefore, you can be in a out in seconds and leave with your jewelry looking sparkly and new! Rhodium plating is what makes white gold rings look bright white and shiny. Since white gold is not naturally white a jeweler will rhodium plate the piece, after polishing, to give it a bright white shiny finish again. Since rhodium plating is not permanent, you will see it start to wear off over time. It is recommended that you have your jewelry polished and rhodium plated once approximately every twelve months. What is the difference between a Diamond Certificate and an Appraisal? A diamond certificate is a document issued by a gemological laboratory describing a loose diamond. A diamond certificate issues a grade indicating the physical properties of the diamond at the time of evaluation. A certificate is a document which retains its value over a long period of time, assuming the diamond does not chip or is not otherwise altered. An appraisal can be performed on a loose diamond, a mounted stone, or jewelry. If the stone is not loose, the physical properties are estimated using various estimation techniques. Most importantly, an appraisal indicates the dollar value of the piece under consideration. Appraisals are most often used for insurance purposes. The four C’s are Carat Weight, Cut, Color, and Clarity. Carat is the weight of a gem. A carat equals 1/5 of one gram. Cut has two components to it. The shape of the stone and the way facets are positioned on the diamond. Color is actually looking for the absence of color or transparency. Clarity is inclusions and natural birthmarks of a diamond and is useful as identifying characteristics. If you understand how diamonds are graded, you have a better chance of finding the right one for you. At Jupiter Jewelry our associates are more than happy to answer any questions you have so please feel free to visit us anytime. The weight of a diamond is often thought of in terms of its size. If you know that you like the look of a 1 carat, for example, you can use this C as the starting point for your diamond search. 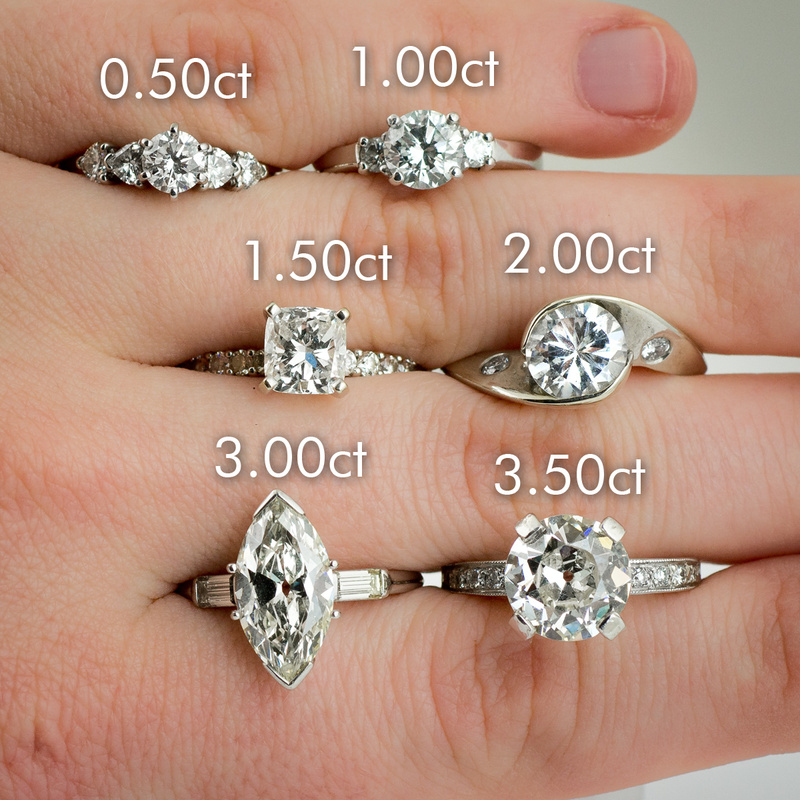 Once you know the carat weight and your budget, you can adjust the quality of the diamond to fit. The photo above shows some common diamond carat weights and how they look in comparison to each other. The Cut of a diamond has two main components. First, cut refers to the shape of the stone. Round, marquise, pear, oval, square, princess all describe the shape of the diamond. 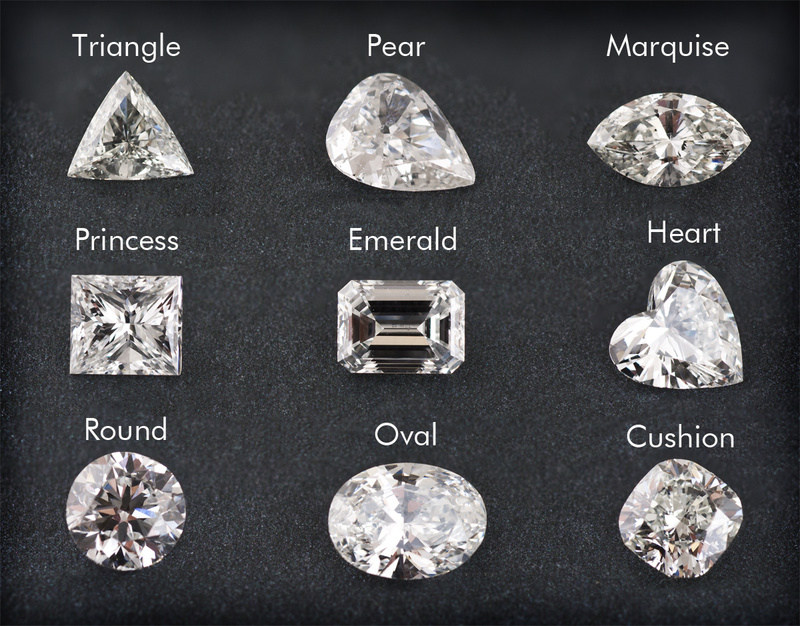 View the picture above to see examples of the most popular diamond shapes. There are many more shapes than we can list here and there are even variations on the common shapes with more facets or different facet patterns. These diamonds (except the fancy) are from our GIA Master Color set. When deciding on a color for your diamond, you may choose to go down a color grade to allow you to buy a larger diamond for your budget. Or, you may want to get the whitest diamond possible. It’s all about discovering what’s most important to you. Also, keep in mind that the color of the metal you set your diamond in will have a big impact on how it appears. If a diamond is in the colorless range (D-F), and it’s set in yellow gold, it may appear to be much more yellow than it is.